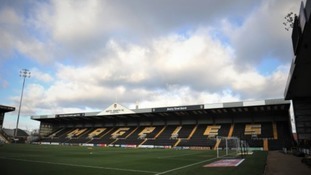 Notts County FC say it's reported abusive messages to police. They say some of the messages have become threatening in nature. Discussions have been ongoing since a payment became due to HMRC three weeks ago. Alan Hardy’s company Paragon Interiors may be heading into administration, but in a statement, he says it will not impact Notts County. Owner and chairman Alan Hardy said the decision was made with the best interests of the club at heart. Coventry City are heading to Wembley after beating Notts County 4-1 in the play-off semifinals at Meadow Lane. Notts County supporters travelling to Exeter for this evening's game are being given a free pasty courtesy of their chairman and owner. Alan Hardy is rewarding his fans who make the 422-mile round trip for the League Two game at St James Park. Each away supporter will be given a voucher at the turnstile which can be redeemed at a food kiosk inside the ground. The Magpies are currently top of the League Two table. To travel that far on a Tuesday night is amazing commitment and the least I can do to thank our supporters is to offer them a bite to eat when they get to the ground. Notts County sit top of League Two after a resounding victory against 10-man Lincoln City. Notts County FC manager Kevin Nolan has signed a new three-year contract with the club. It was a 2-2 draw in Notts County's League Two game tonight against Accrington Stanley. Goals from Jon Stead and Jorge Grant helped keep the score line level.